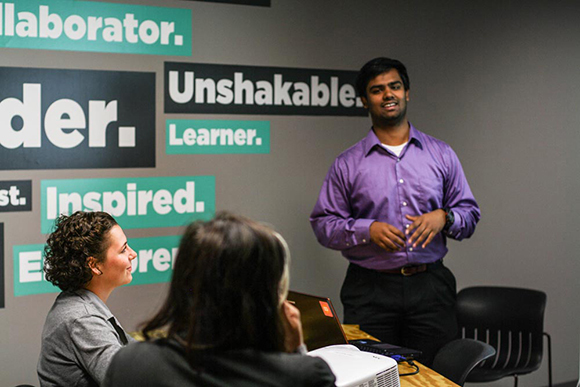 Students present to their supervisors at their community partner during the 2014 DukeEngage program in Detroit, MI. A special Duke Today feature highlights DukeEngage’s new program in Detroit, which launched in the summer of 2014. The feature includes photography by Katherine Black, who served as the program’s site coordinator. The program is led by Matthew T.A. Nash, managing director for social entrepreneurship, Duke Innovation & Entrepreneurship Initiative; and center director, Social Entrepreneurship Accelerator at Duke (SEAD), Center for the Advancement of Social Entrepreneurship, Fuqua School of Business; and Christopher Gergen, CEO, Forward Impact; and a fellow at the Center for the Advancement of Social Entrepreneurship, Fuqua School of Business. DukeEngage in Detroit will run again during the summer of 2015. View the feature in its entirety here.